Travelling on the cheap. Where is the cheapest? User-friendly but expensive. Danish trains are the world's costliest to travel. A couple of surveys by big European travel companies are helping consumers make informed choices when it comes to pricing out their vacations. GoEuro and the Post Office (a currency exchange company) have rated the price of different aspects of travel. As always with comparisons, there’s a few apples mixed in among the oranges. Britain-based Post Office Travel Money’s report on 12 European cultural capitals compared the costs for such high toned cultural attractions as ballet, opera and concert tickets together with entry to the city’s top museum, art gallery and heritage attractions in British Sterling. I converted the Sterling prices into dollars. The report breaks down the individual costs of each of these activities and also offers up a total basket price for all of them. “We based our report on the idea that people would want to visit galleries and museums every day on a short break and spend evenings at music-based events,” said Andrew Brown of Post Office Travel Money. Using the above criteria, Warsaw was Europe’s cheapest city for culture with prices under a third of those in Vienna, Amsterdam, Barcelona and Paris. London was the most expensive despite a 20 percent decrease in prices over the last five years. In Warsaw, tickets to the national ballet or tickets to an opera cost about $32. When all of the prices for cultural activities being cited in the survey were added together, the Warsaw basket was priced at $116. In Vienna and Amsterdam that same basket costs $370; in Barcelona $401 and in Paris $418. The apples and oranges index here tells you that ballet and opera in Warsaw takes a second seat to no one. In Budapest, the basket costs $133. You can go to the State Opera House and see Hungary’s National Ballet perform The Nutcracker for about $25. In Prague the basket costs $154; in Dublin $169 and in Rome $219. It pays to drill down into the London numbers. Though the price of the opera, the ballet and the so-called heritage attractions (Buckingham Palace, for instance, costs $32.75) are extremely high in London, museums like Tate Modern and the British Museum are free. It’s possible in other words to enjoy a fully cultural time in London at very good prices. The Post Office operates more than 10,000 branches that offer euros over the counter in exchange for more than 70 currencies. GoEuro, a Berlin-based travel search website that compares and combines air, rail, bus and car rental options, released its worldwide Transportation Price Index based on the train, bus and flight information for 51 countries across five continents. The site usually confines its comparisons to Europe, but this time took a global picture of what costs what when it comes to transport in different countries. The index cautions that a few grains of salt are necessary, saying, “As investment in infrastructure and quality of service are defining factors in the cost of transportation, it is important to note that countries with higher costs are very likely to be the ones with better service.” In other words you usually get what you pay for. According to GoEuro, the United States is the 22nd cheapest country to travel in out of the 51 that are rated in the Global Transportation Price Index. The index considered such factors as distance, scheduling and taxes for busses, trains and flights between the two most populous cities in each of the countries. Countries were then rated according to average price per 100 kilometers (62.13 miles). In the United States, bus journeys cost $7.92 per 100kilometers; train journeys $18.61; and flights $10.36. The price compares nicely to Switzerland, the most expensive country for transport where bus journeys cost $18.67; train journeys $38.28; and flights cost $125.07. Apples and oranges warning, you can’t compare Swiss trains to Amtrak any more than you can compare Rolex and Timex. In South Africa, the cheapest country to get around in, an average bus journey of 100 kilometers cost $3.67; trains cost $1.88; and flights cost just $11.63. Overall train travel was cheapest in South Africa ($1.88/100km), Georgia ($2.39/100km) and Egypt ($2.49/100km) and most expensive in Denmark ($39.84/100km), Switzerland ($38.28/100km) and Austria ($32.16/100km). Egypt was the cheapest place to by bus at ($1.88/100km), followed by Ukraine ($3.07/100km) and Thailand ($3.11/100km). The Netherlands had the most expensive busses at ($28.58/100km), followed by Austria ($23.45/100km) and Norway ($21.61/100km). The cheapest countries for air travel are India ($10.36/100km), Malaysia ($11.43/100km) and South Africa ($11.63/100km), whilst the most expensive are Finland ($138.90/100km), Switzerland ($125.07/100km) and Lithuania ($116.72/100km). Home to a growing abundance of African wildlife, including a large number of diverse endangered species, Samara introduces guests to the elusive cheetah and the friendly aardvark, as well as many other animals, birds and a huge variety of flora. You will always be guided by an expert ranger, whose in-depth knowledge brings everything to vibrant life. Interacting with these amazing creatures is unforgettable – standing only a few feet from the highly endangered wild cheetah is an unparalleled and humbling experience. This family-owned reserve offers modern colonial living in three elegant locations where wildlife roams nearby, surrounded by the vast mountains of the Karoo. Delicious home-cooked meals are served in various venues – the dining-room, under the stars in the boma or on the veranda as well as out and about when finding game. Combining colonial luxurious comforts with the essence of Mother Nature, the Karoo Lodge treats you to exceptional service, enabling you to relax and allow the tranquillity of the Karoo Mountains to envelop your soul. The Lodge Suites are situated in the main homestead and are light and airy, all opening out on to the wide wrap-around veranda. Each has a luxury en-suite bathroom and is air-conditioned. One extra bed can be accommodated for families with a child. The Karoo Suites are individual Karoo style ‘cottages’ in the garden offering a bit more privacy. Each has a luxury en-suite bathroom, is air-conditioned and has a fireplace. They even have outdoor showers with magnificent views! The Sibella Suites are two delightful suites each with an en-suite shower and sharing a wooden deck overlooking the waterhole with abundant birdlife. They are both air-conditioned. There are two spa treatment rooms at the Karoo Lodge for some much-welcomed pampering, plus an outdoor swimming pool and tennis court. The Manor at Samara is for the exclusive use of up to 8 guests in ultimate luxury and total privacy with every whim catered for by the friendly but unobtrusive staff. Mark and Sarah Tompkins built the Manor on the site of an old house with title deeds dating back to Lord Charles Somerset, Governor of the Cape Colony until his death in 1831. The Manor House is available for rental when the Tompkins family are not in residence. You will arrive at this historic homestead and witness truly breathtaking views of the extraordinary Karoo mountain landscape, which unfolds over a 21m infinity pool, which leads to a waterhole at which game often arrives in the early morning and late afternoon. The Manor is unique with its warm design which reflects the local landscape and traditions with a stylish contemporary twist. You can relax in four spacious luxury air-conditioned suites. Beds are made using the softest linen that lulls you to sleep and all suites have large en-suite bathrooms with separate showers and free standing baths. Unwind in the large comfortable lounge where a crackling fire burns in the winter months and the large glass doors to the patio are cast wide open in the summer. Take time to read an interesting book from the library in the cosy reading nooks. Secluded, wild and remote, Samara’s Mountain Retreat offers you the opportunity to re-connect with nature in its purest form. The Mountain Retreat is an exclusive use venue accommodating up to 10 guests. There are three luxurious double en-suite bedrooms in the main homestead and a further two en-suite bedrooms are in the beautifully restored Victorian barn. A comfortable living room with fireplace and dining room complete the indoor facilities. A wide wrap-around veranda provides the perfect area for relaxing while contemplating the awesome view and the Jacuzzi there is an ideal cooling-off spot. Take leisurely walks to explore the ancient valley landscape where rare rock art paintings of cheetah are preserved. Guests will be accompanied on walks by an experienced ranger who will be able to point out all the little things you may miss on a game drive. Game drives are an optional extra. The Mountain Retreat is the perfect getaway for a family or group of friends wanting to escape from the hustle and bustle and rediscover a slower pace, while experiencing a truly magnificent wilderness. A dog, a horse and a monkey walked into a bar…. It would be nice if there was a punchline, but in fact there's a very good reason that interacting with these and dozens of other animals result in anguish not laughs. Southern Cross Travel Insurance (SCTI) has released its annual round up of animal-related claims and alongside the usual stingers and biters, a few four-legged favourites appear. The most shockingly expensive claim – over $100,000, came from a traveller in Europe who suffered broken bones after being knocked over by a dog. Craig Morrison, SCTI CEO, says that while it's highly unusual for an animal to cause a claim of this magnitude, animals can, and do, cause tourists a lot of grief. Another traveller in Europe was taken by helicopter to hospital after falling from a horse, while an allergic reaction to multiple jellyfish stings in Fiji also required air evacuation for medical attention. "You name the animal – I can pretty much guarantee there'll be a claim as a result! You wouldn't credit the mischief they can cause," says Morrison. "We recently had a claim for shoes that were irrevocably chewed on by rats and then there was the claim, earlier this year, involving an unfortunate encounter with a baby elephant. 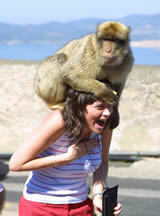 However, it's still monkeys that are the cause of most travellers animal issues," says Morrison. One SCTI customer, bitten by a monkey when traipsing through Southeast Asia, required rabies vaccinations at a cost of around $4,000, while another also needed more than $1,000 of rabies treatment after being bitten by a dog. Monkeys can appear cute and cuddly, says Morrison, so it can be very tempting for tourists to interact with them - and some tour guides actively encourage feeding them – but he advises to respect them as wild animals. "Though monkeys play to their audience, they are fiendishly clever and, ultimately, are wild animals - with teeth, claws and quick hands." · Monkey grabbed phone out of shirt pocket and dropped it onto concrete floor, breaking the screen and making the phone unusable. · Monkey stole backpack in jungle containing fruit, personal effects, knife and cash. · Monkey reached through barred window of a third-floor hotel room and stole mobile phone and toiletries bag. · Monkey snatched prescription sunglasses while visiting a temple and ran deep into the forest.